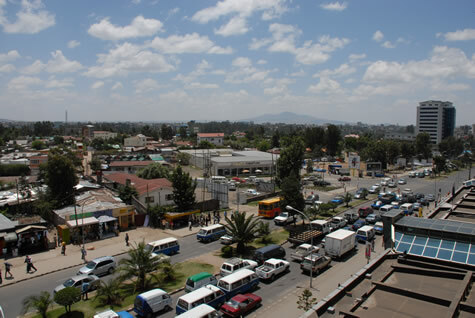 It's coming up on three weeks now being stuck in Addis, waiting on this visa. When I visited Mr Waheed at the Sudan Embassy on Monday I was told that Khartoum had responded, but that I needed to re-request the visa from the Sudanese Ministry of Foreign Affairs in Khartoum via my own embassy. Mr Waheed looked delighted at the news. I tried to share the enthusiasm but inwardly my heart sank. This sounded like the beginnings of a good old bureaucratic run-around, with no end in sight. My contact at the Brit Embassy here in Addis doesn't seem to think that this is basically a way of saying 'no' following increased pressure being exerted by the UN/US/UK on the Sudan government to halt the shipment of arms to the Darfur region. 'It's just the Sudanese being the Sudanese - tricky', they told me. So the application process has to be started all over again through this different channel. Until now the layover has been OK, affording time to work on the website and catch up on a bunch of correspondence that has been on a back-burner for ages. 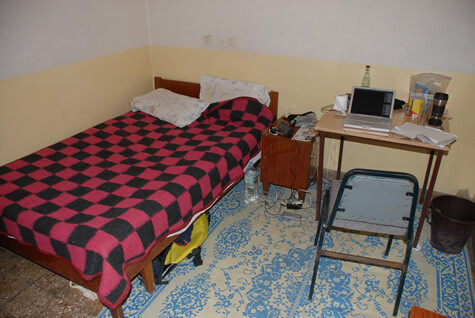 I have a basic but clean room at the Hotel Wanza costing 70 Birr ($8 USD) a night. A small desk allows me to work at the computer and I can even cook in the toilet with my MSR stove to save money. But this morning, for the first time since leaving England in 1994, my 'to do' list is empty and I'm beginning to twiddle thumbs. Aside from running out of things to do and losing all my fitness the only serious impact is on the completion of the circumnavigation before the European winter sets in later this year. 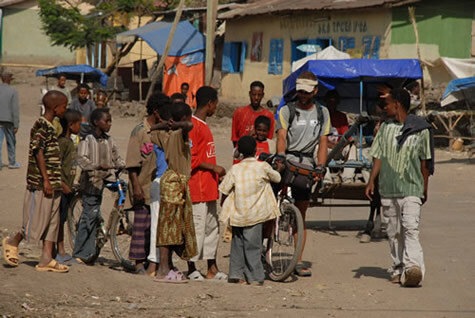 One idea to make best use of time was to complete another section of the ride through Ethiopia from Dessie to Gonder, taking about a week, then return for the visa. But it turns out the flights are $300 USD - too expensive, and the bus takes 2-days each way, again not really worth it. So the only option it seems is just to sit tight here in the Big Smoke. On a more positive note the Moksha shipping drive has now topped the halfway mark thanks to recent pledges from John and Bridget Maxwell, Jenny Mackenzie (of Central American leg fame) and a very generous chunk from Karl Kaseoru. Thank you all! Also we've had one laptop donation for the Sahaj Sankalp kids from the Brady's of Educational Safaris in California - thanks guys. If anyone else has an older model laptop lying redundant please reference the previous blog entry. In other news Erden Eruc of Around 'n Over is about the set out on his own circumnavigation by human power: first riding south from his hometown of Seattle, then rowing the Pacific from San Francisco to Australia starting early June. 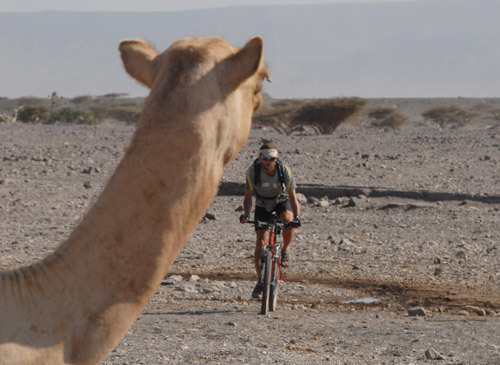 Erden is embarking on a true circumnavigation that not only includes crossing two pair of antipodal points, thereby ensuring legitimacy with Guinness World Records and continuing the historic legacy of circumnavigations completed by similar criteria, but also climbing several of the world's highest peaks en route. Best of luck Erden! I've been in Addis for nearly 10-days now waiting for this visa. I call Mr L. Waleed at the Sudanese embassy tomorrow morning to see if my letter of introduction has been approved by Khartoum. Only then can I actually start the application process (which he assures me will take just other 3-4 days - whoop-de-do!). 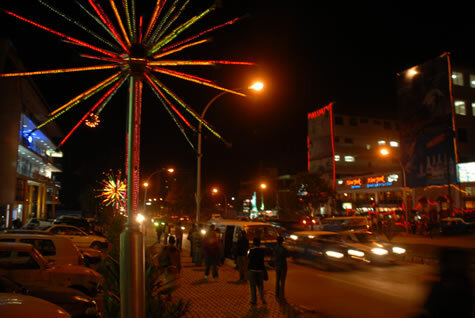 There's not much to say for Addis I'm afraid apart from the delightfully cool temperatures at all times of the day and night. The people are friendly enough and you don't get the annoying 'You-You-You' thrown at you by passers by in the villages. But there are no green areas at all, and you can't walk far without being watched by the police. Yesterday I got into trouble for using my iridium satellite phone in public. A machinegun toting policeman wanted to know if I was using to send out information. "Well yes" I replied truthfully. "I'm speaking to my friend in America". He eventually backed off after giving me the suspicious twice over to determine if I was indeed a threat to Ethiopian national security. But it reminded me that I am currently in a police state where it's prudent to keep a low profile with cameras and other electronics. On a different note I'd like to ask your help with locating some second hand laptops for the organisation Sahaj Sankalp that we met with in Mumbai before the Arabian Sea crossing. They're trying to set up a computer lab for the kids to learn basic computer skills. So if you have a used laptop lying forgotten in a cupboard perhaps you might consider donating it? Drop us a line if so. SAHAJ SANKALP is a non-profit organisation dedicated to assisting children in need by providing education and nutrition in a family home called 'Balgriha'. These are kids from the slums of north Mumbai - kids with few opportunities to get ahead in life. Some of the kids from the Mumbai facility got to pedal Moksha around Bombay harbour shortly before the Arabian Sea crossing! Finally a big thanks to Ian McCormick who recently pledged $200 towards the Moksha shipping drive. Sickness and communications equipment failure have dogged progress these past 7 days leading to the absence of any updates. This post is actually being written in the Ethiopian capital of Addis Ababa where Kenny and I reached 24 hours ago. He flew out this morning back to London and then onto the US. My life for the foreseeable future revolves around the acquisition of a visa for Sudan which apparently can take anything from a week to a month to come through! 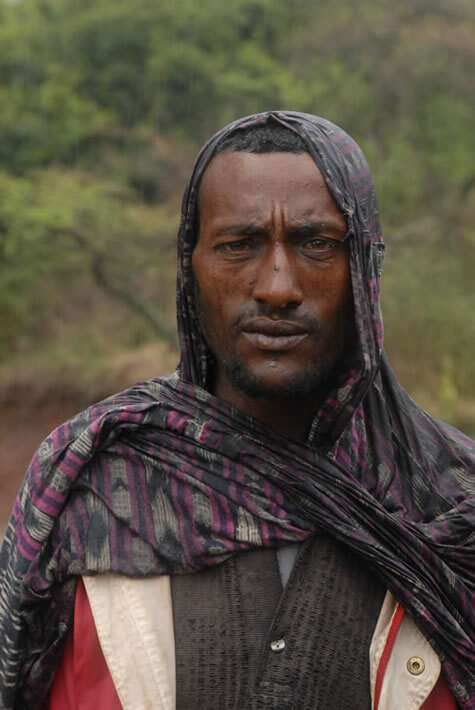 Climbing up from the Afar desert region to the relative heady heights of the Ethiopian Highlands proved spectacular both in terms of the change in climate (delightfully cooler), vegetation and people. 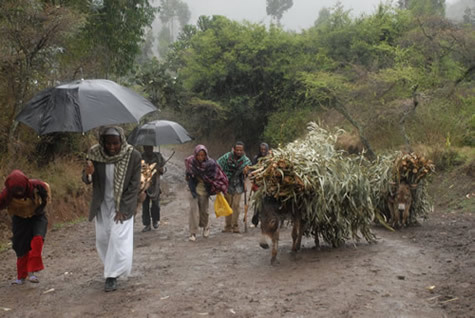 The increased rainfall at this altitude (2000 metres) has been evident in the amount of mouth watering produce for sale by the side of the road - as compared to just firewood down in the desert. There are also many more people supported by the land up here, so stopping in a village becomes a somewhat hazardous affair dealing with crowds of interested folks of all ages who throng all around, either trying desperately to sell us something or just checking out the gear on our bikes. They are in general more friendly than the nomadic Afar who keep their distance more, a testament perhaps to their isolationist way of life where they trust few outsiders. 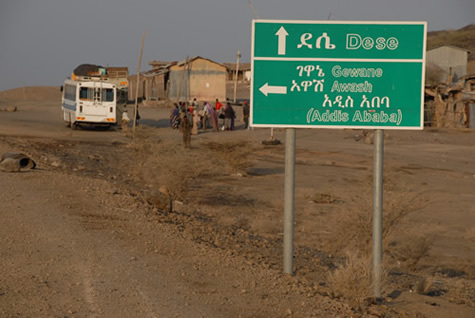 We're now in Ethiopia after a challenging couple of days cutting across country via Lake Assal: the unpaved road marked on the map disintegrated into a camel track at one point and then disappeared altogether while crossing a dried lake bed. Unfortunately this coincided with the hottest part of the day where the temperature reached 48 degrees celcius. This seemed rather severe until we were told by passing travelers how lucky we were to be hitting it at such a cool time: in summer it gets up into the 70s! I can't even begin to imagine how hot that is - another 30 degrees beyond that and one's blood starts to boil. 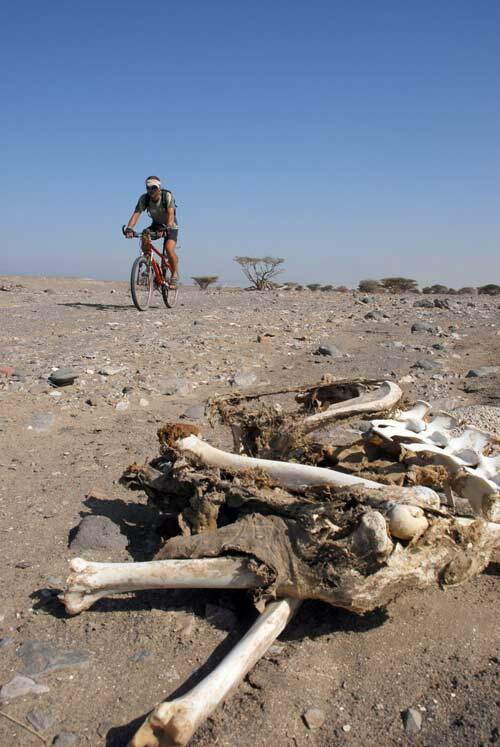 The Afar nomads who inhabit this region must be as tough as coffin nails. Occasionally we've seem them walking far off in the distance; following a herd of goats or just drifting seemingly aimlessly across the desert. 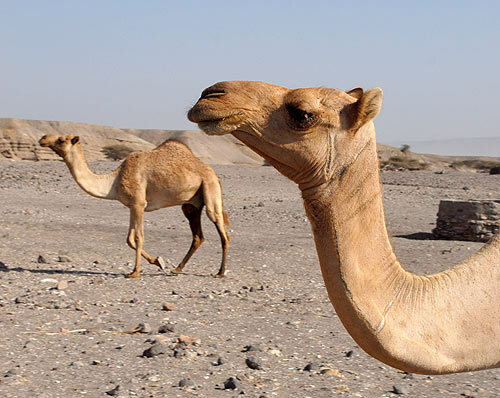 Apart from one water hole with a couple of very depressed looking camels mooching nearby we haven't seen a drop of water in two days; just sand, cracked earth and rocks - billions of rocks. This landscape is like the surface of the moon. Past volcanic activity gives it an other-worldly flavour that screams of extremes: extremes of lifestyle of the people, survival of the plant and animals that dare to inhabit the region. 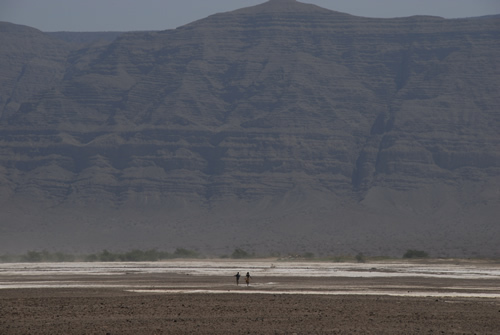 Someone in Djibouti told me that some of the latest version of the 'Planet of the Apes' was filmed here. I can see why. It's like the devil's playground. But now we're back on tarmac which, although rather unadventurous, is blissful to ride on by comparison. Plus we have a blistering tailwind pushing us along at spanking pace to put us back on schedule for Kenny's flight out of Addis Ababa on the 9th. 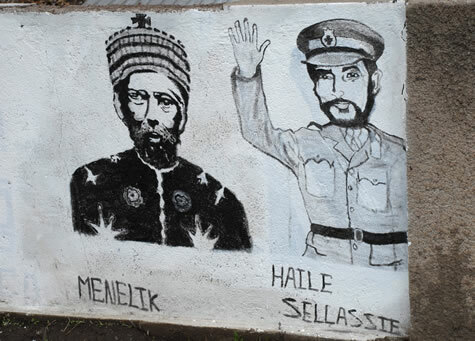 So far all the Ethiopians we've met have been courteous and friendly. Goods are dramatically cheaper here than in Djibouti which is reliant on importing everything. They also have a cracking beer here also called 'St George' with a picture of the saint in question skewering the said dragon. And the best part is the price - a quarter of the price of a beer in Djibouti. On another note a big thanks goes out to an avalanche of kind people who have stepped up to the plate for shipping Moksha back to Europe: Erden and Nancy of Around n Over, Sharon Kessler in Pueblo Colorado, Jane Koca from San Jose, California and Greg Kolodziejzyk, also from the US. Your support is hugely appreciated. At this rate we'll be able to get her off that dockside in Djibouti and off to Europe before the African sun, salt air or light fingers do her any more injustice.